Supreme Court Leaves In Place Law That Effectively Bans Abortion By Pill—For Now Clinics in Arkansas began canceling medical abortions Tuesday. The law, which heavily restricts abortion by medication, is threatening two of the state's three facilities that perform abortions. The U.S. Supreme Court rejected an appeal to an Arkansas law that would make it illegal to have a medication-induced abortion. 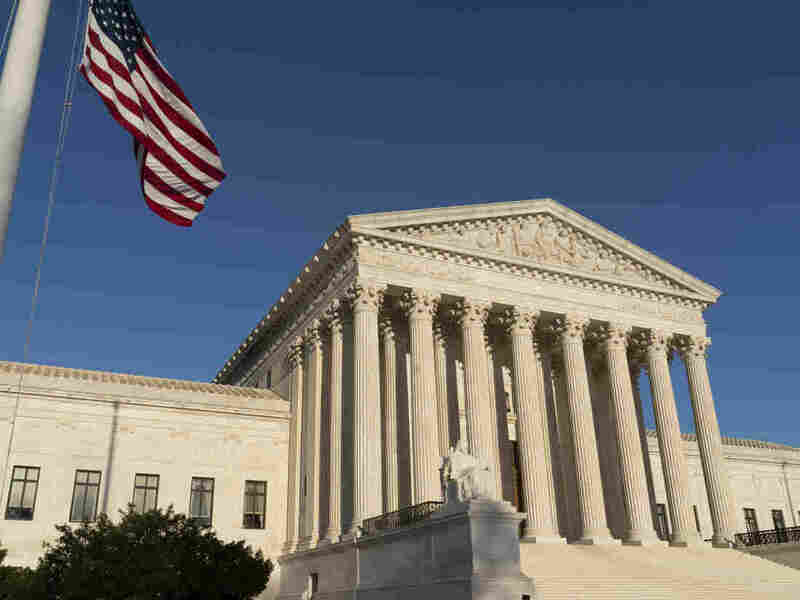 The U.S. Supreme Court refused on Tuesday to hear a challenge to an Arkansas abortion law that, in practice, bars abortions by pill instead of by surgical procedure. The result is that Arkansas is now the only state in the country that essentially bans abortion by pill, a method certified by the federal Food and Drug Administration as at least as safe as surgical abortions. The Supreme Court's decision not to intervene in the case at this point, however, is not final. Abortion-rights advocates had trumpeted the Arkansas case as the first big test of the Supreme Court's 2016 decision striking down key provisions of a Texas law that the justices said imposed an undue and unjustified burden on women's access to abortion. "Arkansas is now shamefully responsible for being the first state to ban medication abortion," Dawn Laguens, executive vice president of Planned Parenthood Federation of America, said in a statement. "This dangerous law also immediately ends access to safe, legal abortion at all but one health center in the state. If that's not an undue burden, what is? This law cannot and must not stand. We will not stop fighting for every person's right to access safe, legal abortion." Family Council Executive Director Jerry Cox had a very different reaction. "This is very good news for people who care about the safety of women in Arkansas," he said in a statement, adding, "This is a pro-life victory not only for the women of Arkansas, but for women across the nation. I'm sure other states will be looking at Arkansas and considering following our example." Arkansas maintained its law was different, because it barred medically induced abortions, using pills instead of surgical instruments, unless the clinic had a contract with a doctor who had admitting privileges at a nearby hospital. Planned Parenthood challenged the law in court, noting that the admitting privileges requirement was similar to the one struck down by the Supreme Court in the Texas case. They pointed to a survey conducted of the state's OB-GYNs that found none willing to endure the public disclosure and consequent harassment and threats if they contracted to provide admitting privileges at nearby hospitals. Federal Judge Kristine Baker in Little Rock then issued a preliminary injunction. In blocking the Arkansas law from going into effect, she cited that survey and the Supreme Court's ruling in the Texas case. She also said that any complications resulting from any abortion procedure can routinely be dealt with by a hospital emergency room. The benefits of the law are few at best, she concluded, and outweighed by the burdens imposed on women seeking abortions. But a three-judge panel of federal appeals court judges — all appointed by President George W. Bush — disagreed. They allowed the law to go into effect, and sent it back to Baker to determine the number of women burdened by the statute. At that point, Planned Parenthood appealed to the Supreme Court, seeking and failing to get the high court to review the appeals court ruling. Helene Krasnoff, director of litigation for Planned Parenthood, said the results of the high court's action are stark. "Women were called today and sent away," Krasnoff said. The women's abortions by pill were canceled. Two of the three abortion providers in the states closed down, she said, adding, "It's not like some procedural game ... in terms of what this really means." The justices did not explain Tuesday why they chose not to intervene at this stage, but no justice recorded a dissent. That would strongly suggest that the reasons were procedural, rather than substantive — in short, that the court didn't want to intervene before there was a final judgment in the case. Indeed, Planned Parenthood said it would immediately ask Judge Baker to make the findings requested by the federal appeals court. It is worth noting that the justices chose not to intervene in the Texas case at a similar stage, with similar results in 2013. Twenty-four of the 41 Texas abortion providers were forced to close their doors, and although the Supreme Court subsequently struck down the law two years later, fewer than a handful of those shuttered clinics have reopened. In Arkansas, only one clinic in Little Rock is equipped to provide surgical abortions, and patients in other parts of the state would have to travel hundreds of miles to get an abortion there. Arkansas has a history of trying to institute restrictive abortion laws dating to fights in the 1990s. Recently, it tried to institute a 12-week abortion ban, which would have been the strictest law in the country. That effort was blocked by the federal appeals court three-judge panel. Abortion by pill, a method increasingly favored by women in their first trimester, is a method that has been found to be very safe, with complications in less than one-fifth of 1 percent of cases — a far lower rate of complications for the mother than carrying a child to term. Two other cases are making their way through the lower courts, testing laws in Missouri and Louisiana that are very similar to the Texas law struck down by the Supreme Court two years ago. Depending on how those cases turn out — and one is before the same appeals court that heard the Arkansas case; the other, the same appeals court that was reversed in the Texas case — abortion could be front and center at the Supreme Court next term, again. A previous version of this story incorrectly spelled Helene Krasnoff's last name as Kasnoff. Previously posted on May 30: A previous Web version of this story incorrectly said the clinic in Little Rock that performs surgical abortions is run by Planned Parenthood.